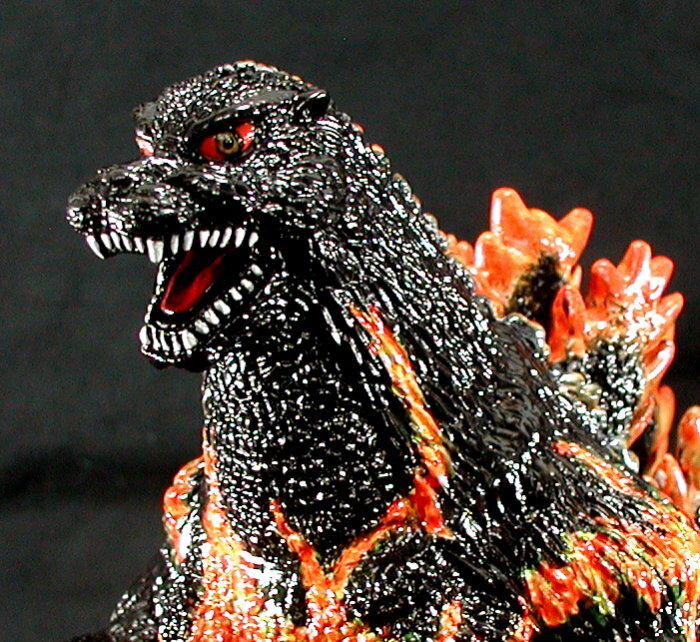 Please let me know if you'd like any of your favourite kaiju figures customized as well. > website for a few recent examples of my artwork. 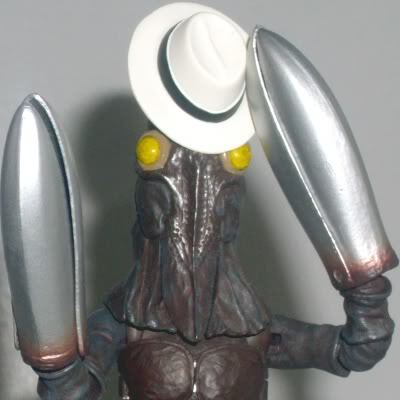 > a commission on getting any of your kaiju figures painted. Hey Gfan54, thanks for the props, very much appreciated!! My photo shelf is somewhat narrow so I had to reposition the huge figure and tripod to take that "rear view" photo, getting the rather enlarged perspective on the tail. Looking at it again, one might think it was a "front view": if Godzilla's tail stays in that position for more than 4 hours, he should seek medical help right away!!! Right now there is a lot of discussion on-going in the "Bandai movie monster figures wishlists" thread about how, when, why or whether any kaiju figures should be painted or repainted, or otherwise cherished and/or despised just as they are. For your consideration, here is an example of what carefully applied color schemes can do to add character, charm and soul to otherwise bland and lackluster painted or unpainted figures. In the end, it all comes down to "personal preference" ... so once you decide to consider having a nice figure being made even nicer, please just send me an email and I would be most happy to help. For the sake of curiosity, where abouts in Ohio are you located? autobutz wrote: For the sake of curiosity, where abouts in Ohio are you located? And for everyone, I just finished completing the webpages for my latest three KaijuZoo commissions so there are a LOT more photo links for everyone to check out. I sure would appreciate some comments on my work (my client and MYSELF think that the Manda is one of my best projects yet)! Manda really does look great, especially with those eyes. Makes him quite expressive. I've got a question about your repaints - nearly every one seems to go for a "metallic" style, kinda like the colors on most Marmit figures. I assume this is because the clients requested them to look that way? 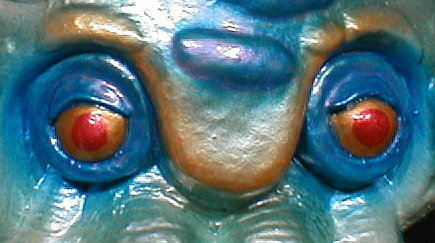 Giganzilla wrote: Manda really does look great, especially with those eyes. Makes him quite expressive. :D Thank you! My client had distinct ideas on how he wanted Manda to look. So with his suggestions, we worked together via email on the color choices and placement while still allowing me some artistic freedom. I think the Manda is one of my best efforts yet! Giganzilla wrote: I've got a question about your repaints - nearly every one seems to go for a "metallic" style, kinda like the colors on most Marmit figures. I assume this is because the clients requested them to look that way? It depends. Paint schemes for each figure depends on whether it is an exclusive series (I have total design control) or a custom job (client has their own ideas and we work together on the final paint concept). Additionally, use of "metallic" paints also depends on whether a figure is more realistic than stylized. 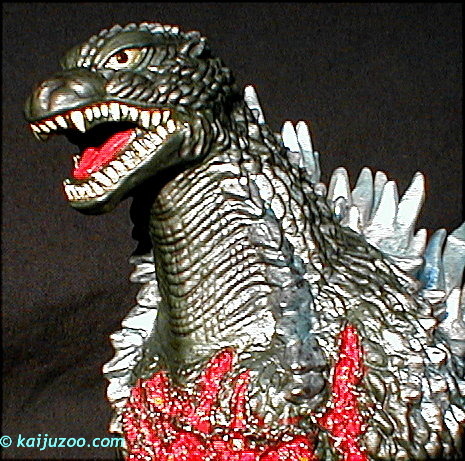 For example, the two Godzilla exclusives, G1962 and the Meltdown G were both completed with non-metallics. As for the realistic Gezora figure though, it was my choice to use the metallics in order to pay homage in emulating the original Bullmark paint scheme. By and large, in my own perspective for my "three-dimensional art", I LOVE the look and feel of metallic paints and I have a good many commercial-grade colors in stock to produce my results. For the more stylized figures, I think metallic base coats and complementary accent colors are well suited for the intended purpose of making a distinctive fantastic kaiju sculpt even better. Metallics or not, I'd be happy to paint you one either way!! Thanks again for your compliment and inquiry! WOW does Manda & Varan still glow? I'll never look at my Marmit Varan the same way again. He's missing so much color. Beautiful work John!! gforever wrote: WOW does Manda & Varan still glow? I'll never look at my Marmit Varan the same way again. He's missing so much color. Beautiful work John!! call my "3-dimensional kaiju artistry"!! glow Manda! And it's just gorgeous! while glowing in the dark! in both light conditions! I think John has done a stellar job at this! webpage for all of them yet. 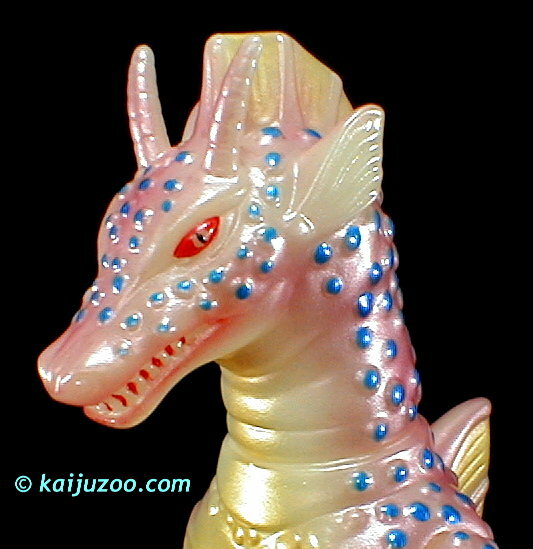 Just check KaijuZoo.com in the coming days!! My client was looking for a dark & sinister look with Godzilla going into atomic radiation mode, we think it is a vast improvement over the original Bandai paint scheme. This one uses color-shift interference paints which have subtle blends of different colors depending on the angle of the light, most notably on the fins, chest and legs in natural light. I am currently finishing up three other client projects and also just added the Bandai 8" scale GMK Godzilla to the list of figures I currently have available for commissions. Please email me through the website if you would like to discuss any painting projects. Happy Thanksgiving to Everyone !!! Hey John! WOW that repaint of the Bandai Creation GMK Goji is incredible!!! gforever wrote: Hey John! WOW that repaint of the Bandai Creation GMK Goji is incredible!!! Hiya Andrew, Many thanks for your compliment on the Bandai GMK, my client too was quite pleased ! 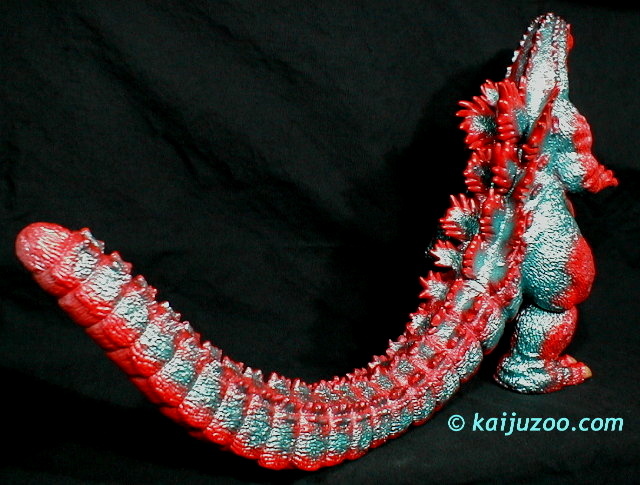 And to everyone, here is another project I just completed last week, a custom KaijuZoo Marmit Gezora. As noted in the Client Feedback and my own reflection, I really think I outdid myself this time!! There are three interference paints used: that is, the color shifts depending on the angle of the light. In this case, green becomes blue, yellow-gold becomes green and blue becomes lilac red (very noticeable on the Left 3/4 View pic). 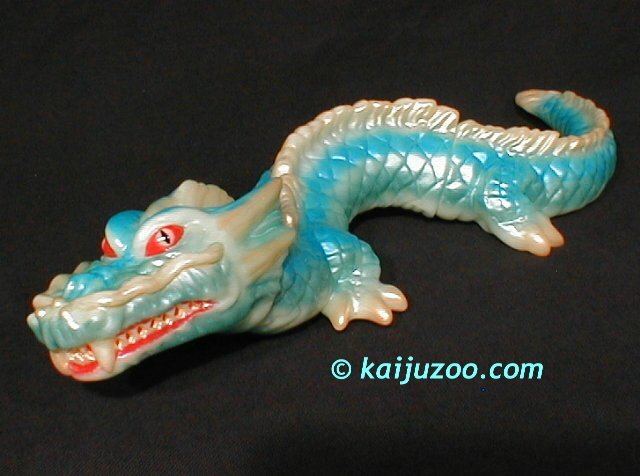 The overall effect was to give the Gezora more of an iridescent marine animal slimy look. Please let me know what you all think and if you would like your own custom Gezora to coincide with the upcoming release of the YOG DVD coming out next month - Yippee !! 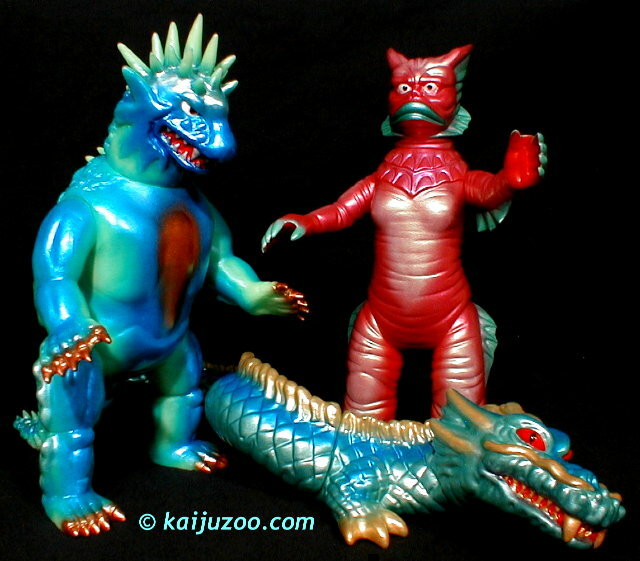 The Gorgo, Gamera, Hedorah and Gezora are from different KaijuZoo exclusive series, and the red GMK Godzilla is a custom job. I really like it a lot and I'm hoping to get a few more KZ custom paint jobs soon. Thanks GFan for your cool thumbs up!! I'd be pleased to set you up with a custom figure that you'd be proud to show off. 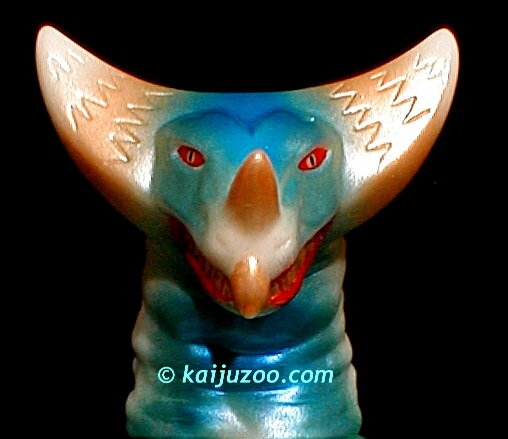 And many thanx to you too Glow-nut for your repeated vote of confidence in my "3-dimensional kaiju art" !! I am looking forward to getting started on your new commissions. Thanks again and Happy Holidays! - the "Ultra" cool Glow Marmit Gomora. Please let me know whacha think and Happy Holidays to all !! I just posted the webpage for my latest completed project, the Bandai Battle Damaged Godzilla '03 as seen in the Godzilla X MechaGodzilla movie. In GXM, Godzilla gets hammered by MechaGodzilla as evidenced by huge open wounds in the chest and shoulder. 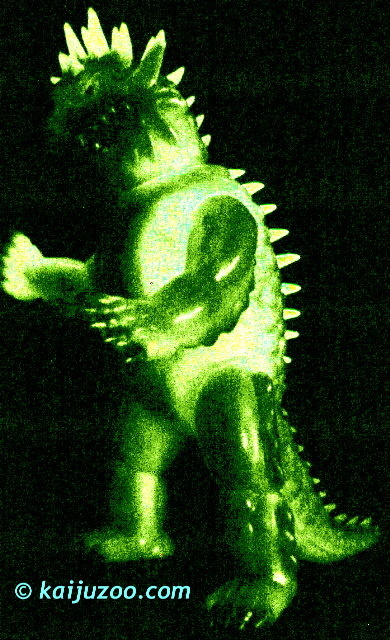 We see that in the subsequent film (GMM: Tokyo SOS) that Godzilla's wounds are healed and for their 2004 GMM vinyl figure, Bandai also showed the healed wound but to my knowledge there have been no production toys showing the actual battle damage. Please take a look! Thanks. I have been quite busy lately but I thought I would take a moment and post a reference to my two latest completed KaijuZoo commissions ! Another great custom paint jobs from the Kaijuzoo master! Thanks for sharing! by the way, how much is the custom painted G2003 & Burning G? Burning G is my fav and you've done such a beautiful job! I dont buy customized figures, but that Godzilla is BEAUTIFUL. I'm so tempted. In fact, it'd be pretty cool to take this figure and just paint it like a traditional Heisei Godzilla. What would be cool would be if you could get a hold of a bunch of Memorial Box 1968 Godzilla (or some Marmit 1968s) and paint as if it was Godzilla at the end of Godzilla vs Hedora with the sludge eye and the bone hand. gforever wrote: by the way, how much is the custom painted G2003 & Burning G? Burning G is my fav and you've done such a beautiful job! Thank you Andrew, very much appreciated !! Each of those two Bandai's were completely disassembled, washed, glued, filled with hard dense paper mache and the joint seams detailed with art epoxy putty.. And THEN, the painting could be started. If you are interested, send me an email and I would be happy to discuss a custom KaijuZoo commission with you.